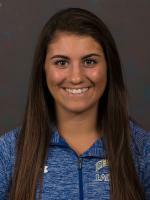 Megan Santoleri is currently a midfielder at the University of Delaware. Prior to Delaware, Meg attended Archbishop Carroll where she was a 1st team All-American. She also played club lacrosse for Phantastix. Archbishop Carroll (High School): US Lacrosse All-American from Archbishop Carroll • two-time All-Catholic and All-Delco honoree • three-time All-Main Line selection • posted 26 goals, 64 draw controls, 34 caused turnovers and 49 groundballs as a senior under head coach Lorraine Beers • led team to the Catholic League championship • also played two seasons of field hockey and one season of soccer • played for the Phantastix club team • Honor Roll student and member of the National Honors Society.